Jason Sypher on Monday pleaded not guilty to charges of murder and hiding a corpse in connection to his wife’s disappearance. 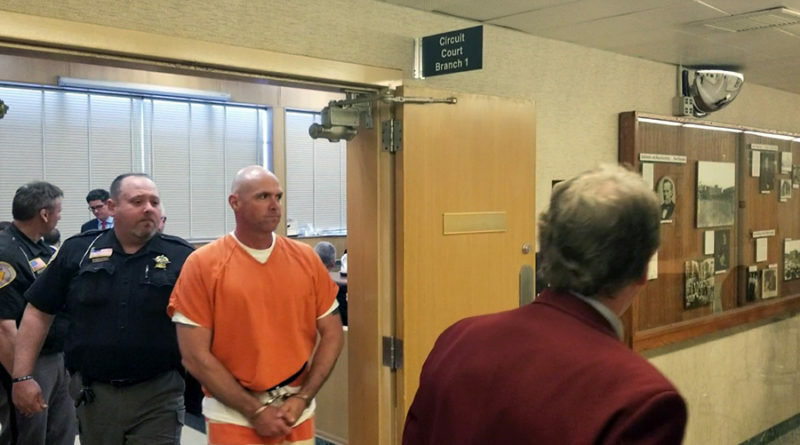 Sypher, 44, appeared in court before Judge Thomas Eagon on Oct. 8. Jason Sypher was arrested on Aug. 24 during a high-risk traffic stop on I-39, about five miles north of the Illinois border, on charges of first-degree intentional homicide and hiding a corpse. Sypher’s attorney Gary Kryshak argued investigators had “no body and no blood” to indicate Krista Sypher, 44, was dead. Judge Thomas Eagon admitted during a Sept. 10 preliminary hearing that evidence against Jason Sypher was largely circumstantial but said it pointed to a reasonable likelihood that Krista Sypher “was no longer alive” and that her husband was somehow involved. Krista Sypher has been missing since March 13, 2017, the day Jason Sypher said he last saw his wife. Plover Police Chief Dan Ault said the investigation had been ongoing for almost 18 months, due in part to the family’s initial belief that Krista may have left on her own, and later compounded by the massive search area they would encounter. The criminal complaint said GPS records from the Syphers’ Chevy Cruze indicated multiple stops at or near public dumpsters around the Plover area, to include the Portage Co. Solid Waste Transfer Facility, in the days following Krista’s disappearance, requiring numerous police searches as far away as Mosinee for her remains or other evidence. Krista Sypher’s body has not been recovered. Jason Sypher was also captured on surveillance video at Menard’s on the night of Krista’s disappearance, where he was seen purchasing 39-gallon black garbage bags with cash. Police say Jason Sypher omitted that detail each time he was interviewed about his activities the day she went missing. Plover Detective Mike Tracy testified on Sept. 10 to a “long, oblong item that could have been a body wrapped in plastic” observed via surveillance video falling from a garbage truck at the Mosinee Transfer Facility where garbage from the Sypher’s neighborhood was taken, but the item was not recovered or positively identified. Police also used a special K9 dog trained in detecting human remains during one of the searches in the Sypher home. Kryshak objected to the evidence, saying he questioned the accuracy of the dog’s alerts, which occurred at various places throughout the home and inside Jason Sypher’s truck. Jason Sypher returns to court for a pretrial conference Feb. 11. He remains behind bars on a $750,000 cash bond. ← Public works dept. identifies road project delays expected by Stanley St.